Today I waved my niece and nephew off as they flew back to Scotland after an action packed holiday filled with trips to Wild Wadi, I-Fly and quad biking in the desert. It was not all doom and gloom ahead of them however, as they had Easter to look forward to. Next weekend they will spend Saturday boiling eggs and carefully painting them, ready to take to the hills on Easter Sunday to roll the eggs. With Dubai being such a multicultural melting pot, it left me wondering, what other traditions at Easter there are around the world and maybe our multicultural population brings some of these traditions with them to Dubai. Chocolate Easter Eggs are a popular part of Easter Celebrations throughout the world along with chocolate bunnies but in 1991 Australia decided to replace the bunny who was seen as a pest to many farmers with the “Easter Bilby” which is an endangered native rodent with rabbit like ears. In Brazil, Easter is a huge festival and famously preceded by the Rio Carnival. Rio celebrates with dancing in the streets and many colorful carnival parades and samba dancing troupes. After a month of lent and fasting they again celebrate with huge gala days on Easter Sunday to celebrate the resurrection of Jesus Christ. Even though in India only 2.5% of the population is Christian, Easter is still celebrated in a big way. Most of the Christians are based in Mumbai, Goa, Mangalore (South) and the North East. Like the west they exchange chocolate eggs and in Goa they exchange colorful lanterns. In Mangalore they enjoy special buns cooked out of dhal and rice to eat with a pork or lamb curry. In France the shops in the days leading up to Easter are beautifully decorated with exquisite white and dark chocolate rabbits, chickens, bells and fish. They believe that the bells of the churches fly away to the Vatican to mourn Jesus’ Crucifixion and return on Easter Sunday therefore the church bells do not ring between Easter Friday and Easter Sunday. 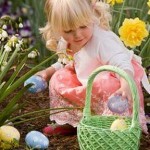 Like in many countries children decorate eggs and rolls the eggs. This signifies the rolling of the stone from the tomb where Christ laid. The main religion in the Philippines is Catholicism and like all festivals in the Philippines Easter is well celebrated. On the week in between Palm Sunday (the Sunday before Easter Sunday) and Easter Sunday they fast and use that week as a time to reflect. On Good Friday many Filipinos reenact the walk Jesus made with the cross and even act out Crucifixion. On the Saturday they continue to fast then on Sunday the whole family go to church to celebrate. Like the west they now have adopted the tradition of an Easter Egg Hunt. 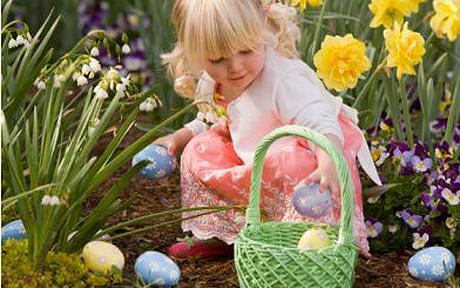 In Russia Easter is known as “Pascha” and eggs are exchanged that are red in color. These eggs are called “Krashenki” and the eggs become red by boiling eggs with onion skins. In Lebanon homes prepare a delicacy for Easter called “Maamoul. These are small cakes filled with walnuts and dates which all members of the family help in preparing. On Palm Sunday a procession takes place called “Shanineh” which is led by a priest and children are carried on their parents shoulders carrying candles decorated with flowers and ribbons. In Greece the Easter Sunday service in churches is sometimes started with fireworks. This represents that when Jesus rose to life on Easter day he got rid of the darkness of Evil. Many other churches throughout the world use candles. In Europe Easter Bonnets are very popular to wear at Easter time and they are often adorned with flowers to celebrate spring. In many countries they have contests to see who has designed the best Easter Bonnet. In the UK Hot Cross Buns are eaten on Good Friday. These are yeast dough buns with currants and raisins in them with a cross designed on the top of them to represent the cross that Jesus died on. They are very yummy! Which ever way you choose to celebrate, have a Happy Easter.